These coconut sundae cones have all the nostalgia of childhood summers with the addition of a surprise tropical twist! Coming home does have it’s perks. Obviously picking up the dogs from their pet hotel is super exciting. But this time, I also had something delicious waiting for me in the freezer. I may no longer be in Hawaii lounging oceanside sipping on fresh coconut water. I am back in the comforts of my living room enjoying these satisfying coconut sundae cones! Did you enjoy sundae cones (Drumsticks) as a kid? I SURE DID! 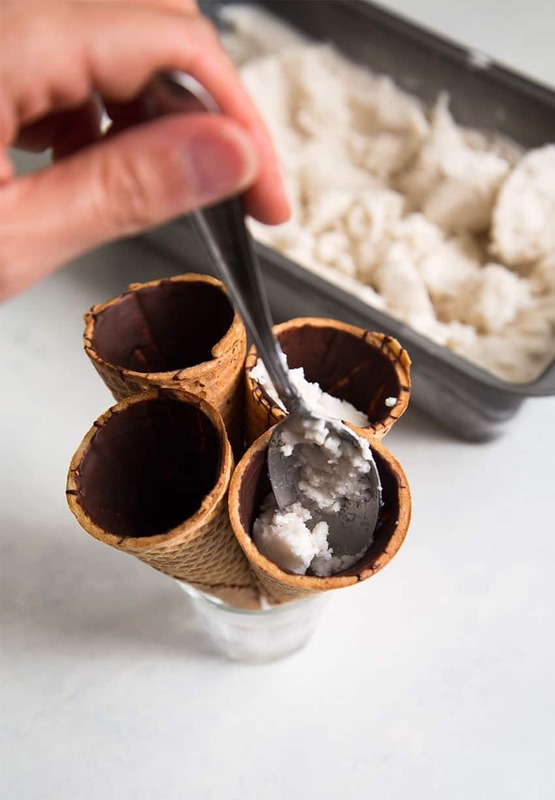 There were ice cream staples that were always in our freezer thanks to my dad: Drumsticks, Bon Bons (now known as Dibs), and Viennetta (do you remember those?!) One thing my dad definitely passed on to me was his love of ice cream. It’s been forever since I’ve enjoyed a sundae cone. That changes today. My freezer is now stocked with all sorts of frozen goodies to last me through the end of summer. Just like the traditional sundae cone, I coated the inside of the cones with melted chocolate. This helps to strengthen the cone and keep it’s crunch, but it also prevents the ice cream from leaking out. Pop the chocolate lined cones in the freezer for a few minutes to harden the chocolate. 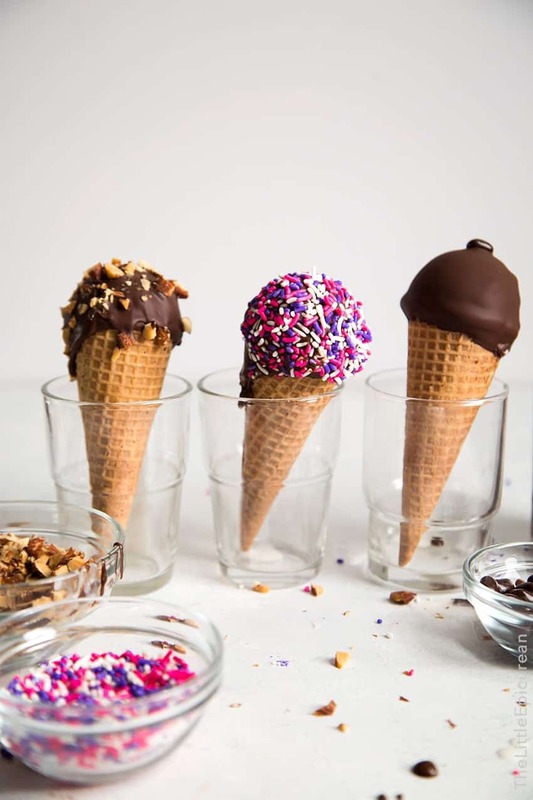 Fill the cones with ice cream, followed with a rounded scoop on top. Place the cones back in the freezer to ensure the scoop is firmly attached to the cone. And then comes the fun part! 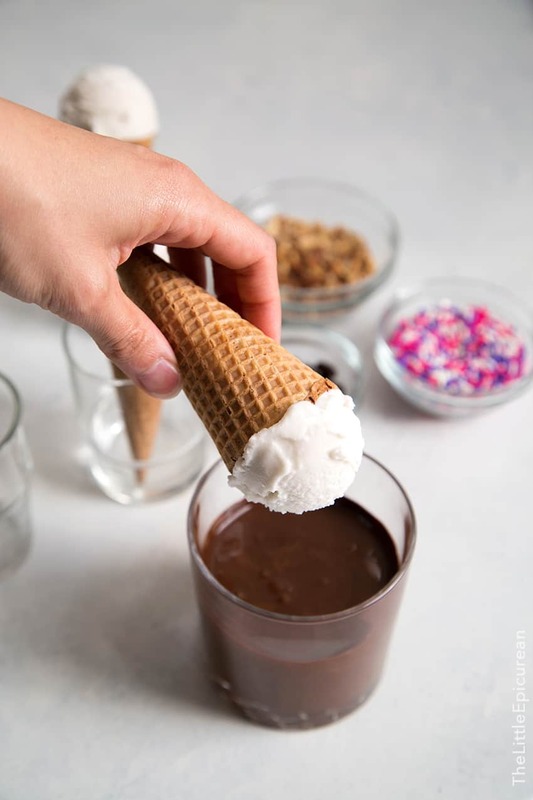 Dip the ice cream cones into a mug of “magic chocolate.” It’s a melted mixture of chocolate and coconut oil. 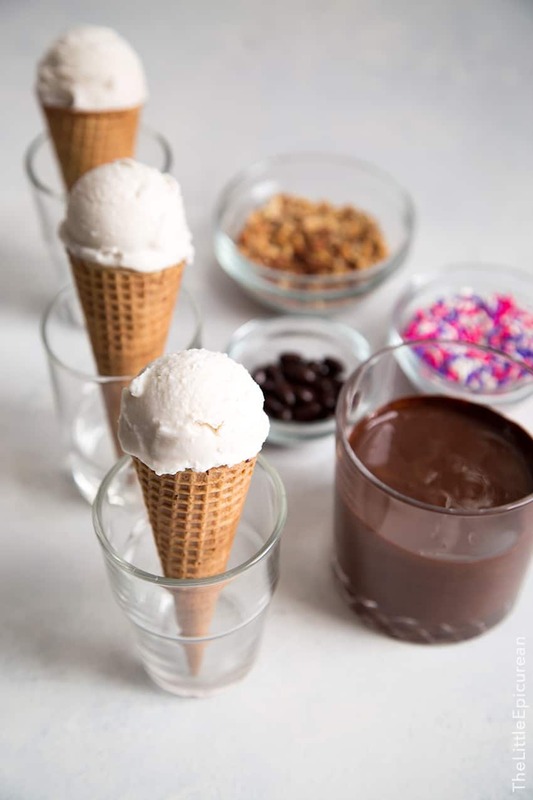 The cold ice cream will harden the chocolate thanks to the addition of coconut oil. Immediately add your desired toppings before the chocolate sets. The sky’s the limit when it comes to toppings. From chopped nuts to sprinkles to candies, you can have as much fun as you’d like. 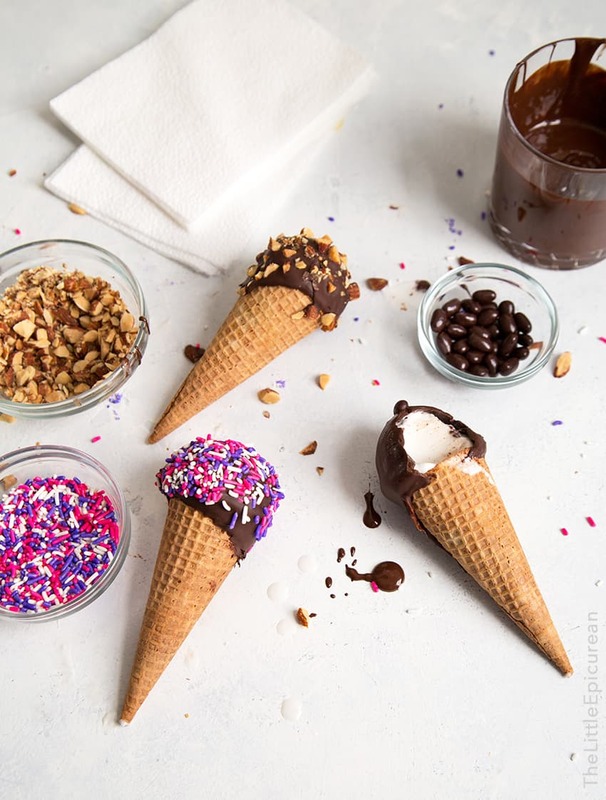 Keep your summer ice cream sundae cones tradition alive with these homemade sundae cones! 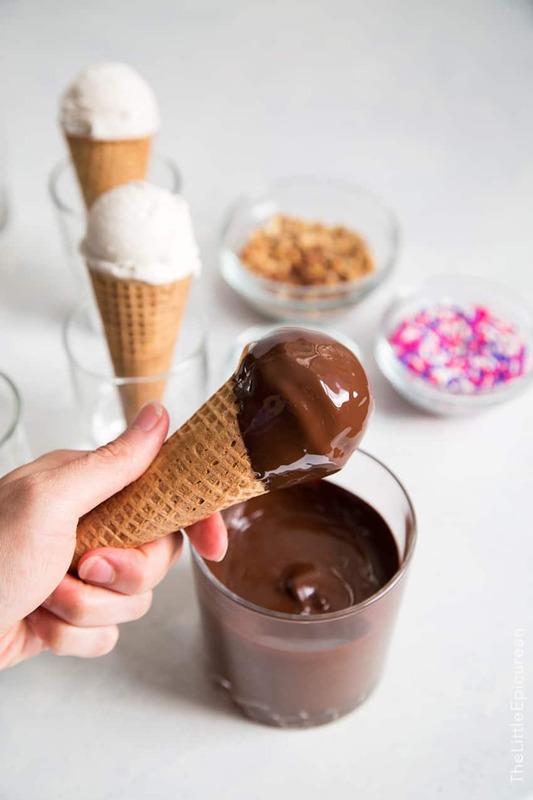 Spoon some dipping chocolate into a sugar cone. 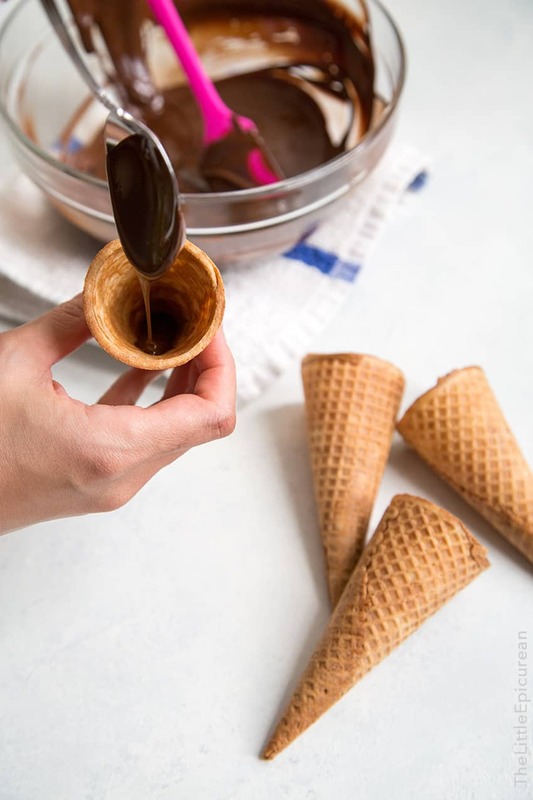 Use a mini offset spatula to coat and cover the inside of the sugar cone with chocolate. Repeat with remaining sugar cones. Place upright in the freezer for about 2 minutes to set chocolate. 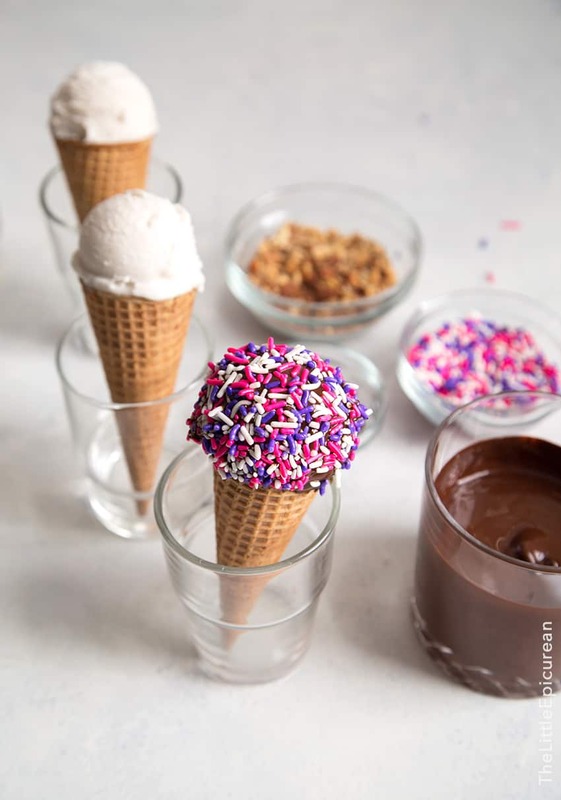 Fill sugar cones with coconut ice cream. Add a scoop on top. Place back in the freezer until ice cream is solid. Meanwhile, pour dipping chocolate into a wide mouth drinking glass. Prepare desired toppings. Remove coconut sundae cones from the freezer. Working quickly, dip sundae cones into dipping chocolate. Immediately coat with desired toppings. Repeat with remaining cones. 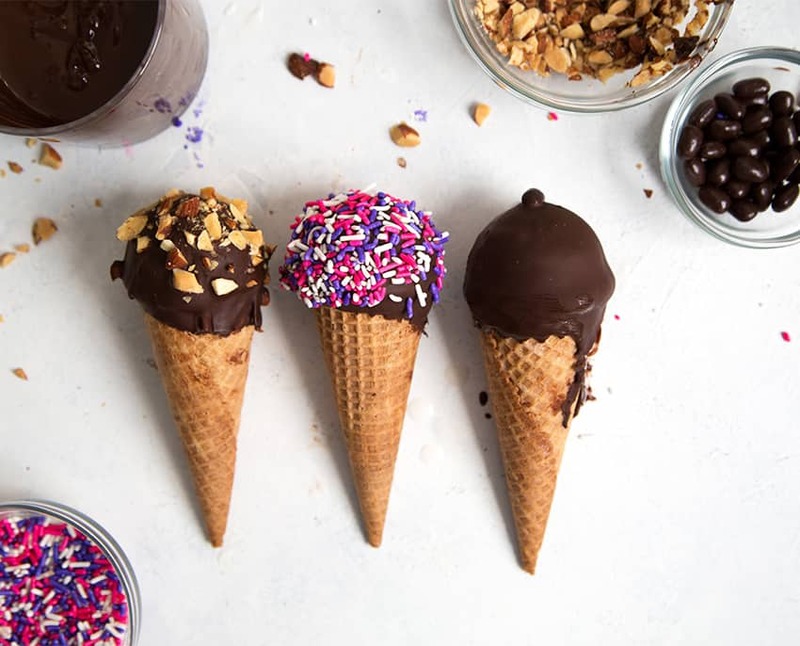 Place sundae cones in the freezer to set chocolate. Enjoy immediately, or store in the freezer until ready to eat. Place chopped chocolate and coconut oil in a heat-proof bowl. Set over a pot of simmer watering, creating a bain-marie (double boiler). Melt chocolate over low heat. Stir to combine. Once chocolate has melted, remove from heat. Recipe for homemade coconut ice cream can be found here. Feel free to substitute store-bought coconut ice cream or your favorite ice cream flavor. This is exactly what I want right now. I’m going to pretend my mediocre sandwich is a coconut ice cream cone….. I could so do with one of these right now! It’s been really hot in the UK (makes a nice change…). I’m totally on board with lining the cones with chocolate, the more chocolate the better!